I don't use this to determine when to get on the air. Originally planned to be a three-summit multi-state hike, it turned into just two summits, remaining in one state. With high elevation, snow, exposed ridge lines and freezing temps, this became an adventure not soon to be forgotten. On this trip, I was joined by fellow SOTA addict Jamie N6JFD. We’d talked about the trip for months and it was finally happening. This was originally planned to be a three-summit multi-state hike. We’d be summiting Montgomery Peak, Boundary Peak (Nevada state high point) and Trail Canyon Peak. Due to various challenges, it turned into just two summits. With high elevation, snow, exposed ridge lines and freezing temps, this became an adventure not soon to be forgotten. On this trip, I was joined by Jamie N6JFD. We had talked about this trip for months and it was finally happening! These summits would be my very first Nevada SOTA activations, and actually my first hiking and peak-bagging of any kind in Nevada. Jamie lives in South Lake Tahoe, so the plan would be for me to drive up from San Jose Friday morning and finish up work remotely at his house. Following that, we headed out to Nevada. There are a couple of different ways you can get to Boundary and Montgomery Peaks. We’d elected for the “Queen Mine” route, so that we could activate up to three SOTA peaks on our hike. It would also put our base camp at Kennedy Saddle, right below Kennedy Point, which is right below Mustang Mountain – another SOTA peak. Google Maps actually guided us faithfully to our destination. That said, I’d previously downloaded the offline maps for the area, knowing there likely wouldn’t be any cell service. Still, I’ll describe the last part of the route. Coming from California on US-6, go 2.5 miles after crossing the CA-NV border. Take a right turn onto the nice, wide dirt road. Across the highway from this turn, there’s a water tank that has the letters “JR” on it. It used to be a brothel called “Janie’s Ranch.” We couldn’t really see this since it was dark by the time we got there, but we could tell there was a water tank and some buildings lurking in the darkness. Pulling onto the dirt road, this is where the fun would begin! With Jamie’s supercharged Tacoma, we headed up the dirt road. It starts out pretty smooth and straight, then gets more interesting the further you go. Early on, we made pretty good time with the Tacoma’s off-road light bar. The road definitely starts getting rough a few miles in. I wouldn’t take a car up the road unless it had good ground clearance, but it could be done to a certain point. That point is Queen Mine. It’s a wide, flat area about a mile before Kennedy Saddle where the trailhead is. A lot of people stop there and hike up to the trailhead. We kept going. The road got even more rough, but still not at all an issue for Jamie’s off-road superbeast. We arrived at the saddle around 8pm. We’d missed the sunset with various travel delays, but quickly got set up. I set up my tent (minus its rainfly) and Jamie got his truck situated (he’d be sleeping in the pickup bed). We cooked our meals and had a nice, relaxing evening. Before going to bed I tried to make sure my stuff was ready to go for the morning. Waking up as the pre-dawn light struck my tent the next morning, I heard the sound of an animal walking nearby. It turned out to be a buck exploring our camp. I didn’t get a very good picture in the low light. I got up and explored a bit. I was warming myself with activity, waiting for the sun to come up. I moved my tent to a spot more protected from the wind, in between some nearby bushes. Before long, the sun was up. It was at this point I realized Jamie and I hadn’t really thoroughly discussed our start time. We loosely figured we’d get going a while after sunrise, not thinking about the fact that the sun rises relatively late in October! So when the sun came up just before 7am, we were probably already a little bit behind on our timing to make it to Montgomery Peak. Of course, my fuzzy morning mind didn’t remember my timing realization from earlier. It took us a little over an hour to eat, pack and be ready to go. From where we were, it was pretty easy to tell there was snow on the upper part of the route, but it didn’t look like much. I’d brought my waterproof hiking boots, but opted to wear my trail runners with some gaiters. I’d slightly regret this choice, later on. I packed as minimally as possible, while still bringing the necessities for varying conditions, and lots of water. About 20 minutes before we started our hike, another vehicle came up the road and parked nearby. It was another hiker going for Boundary Peak! 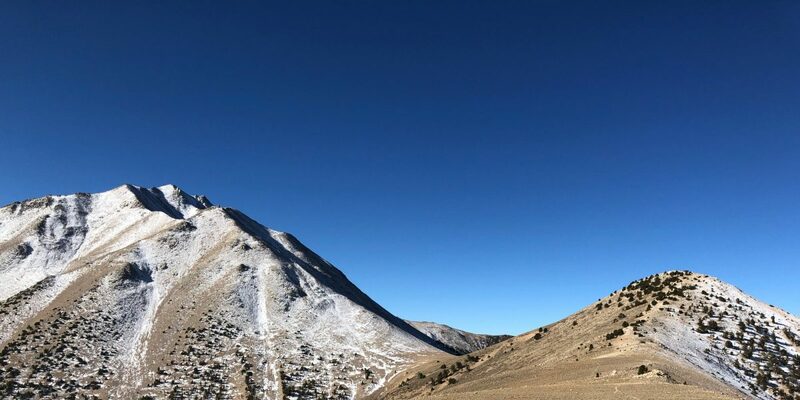 The plan would be to hike out past Trail Canyon Peak, up the ridge to Boundary, then along the knife-edge ridge crossing the state border to Montgomery Peak. We’d activate Montgomery, then head back to Boundary and activate that, followed by Trail Canyon Peak if enough time remained. A little after 8:30am, we started up the trail. Just up the hill from our camp, the trailhead. The trail begins climbing immediately, with a set of switchbacks. Even at a “mere” 10,000 feet elevation, I was definitely feeling the thinner air. It didn’t seem to bother Jamie, who lives at 6200 feet, but who knows?! About 40 minutes into our hike, we were rocking the easy part of it. Following the ridge that leads up to Trail Canyon Peak (and saddle), we had an excellent view of the beast of a climb we’d be tackling for a good chunk of the day. As we got closer, it was getting more apparent that I’d want slightly more robust footwear. But I wasn’t yet concerned. More daunting was the sheer scale of the climb in front of us – something hard to capture in a photo. When we got to the saddle below Trail Canyon Peak, it was readily apparent I should have worn my Gore-tex boots. I got slightly concerned at this point, but not enough to stop me. Looking up at the steep climb ahead of us, it looked rocky enough that I’d be able to keep my feet mostly out of the snow, thus warm and dry. I was wrong! Not too far ahead of us, we could see the person that’d started before us. He was making slow progress, but progress nonetheless. We seemed to be (very slowly) catching up. For the most part, the snow cover wasn’t actually very deep or difficult. But it may have made the hike slower than it otherwise would have been. Sometimes, the choice was snowy use-trail or loose rock. Long stretches were both loose and snowy. As the ridge climbs, the exposure gets a little more real. There were a few use-trail sections traversing 45+ degree rocky slopes, so I watched my footing and made sure I was paying attention. Jamie, being a search-and-rescue guy, asked if I was familiar with self-arresting. I told him I’d practiced it with an ice axe on snow. He then explained how it can be done without an ice axe (similar concept). I think it was around half way up I decided to go ahead and put my climbing helmet on. There were some sections that were a little more class 2, with one section where we decided to do a super easy class 3 scramble in order to avoid a really snowy section. My feet had been getting quite cold, since my shoes were basically saturated. My toes were numb on and off toward the end, but once we were consistently in the sun, they started warming up a little bit. Nothing like a nice, easy scramble at 12,000 feet! Right around 12,800 feet, we (mostly) made the decision not to go all the way to Montgomery Peak. It was about 1pm, which was already well past our posted time for summiting Montgomery, and we weren’t even at the top of Boundary Peak yet (we were close, though!). The spot where we made this decision was actually a pretty decent spot for a bivouac if we found ourselves unable to descend before dark, so we seriously considered pushing on to Montgomery. Jamie was a little more into that idea than I, since he was a little better-prepared for the cold. Either way, we both decided against it. Another reason this spot was good for decision-making is that we could actually see Montgomery Peak. The snow-covered route up its east side did not look promising. Even if it weren’t dangerous (this whole thing had a degree of danger), it would be very time-consuming. So we were 90% sure Boundary Peak would be our farthest destination for the day. A little while later, we made it to the top. It took us 5 hours. We took a few minutes to enjoy the views: the valleys 7000 feet below and nearby peaks of the White Mountains, including Montgomery Peak, which we finally made a resolute decision not to attempt. We chatted with the person that’d made the summit just a few minutes before us. He was from Texas, here to bag the state high point for Nevada. I signed the summit register, then Jamie and I both started setting up our equipment for the SOTA activation. We’d previously agreed in which order we’d work the bands, so as not to interfere with each other. We also tried not to set up too close to one another. I set up pretty much right near the summit, with Jamie about 40-50 feet away. I didn’t really get any good pictures of my setup, but I basically threw my end-fed half-wave wire down the SE slope of the peak, stuck my pole in some rocks on the summit and ran sort of a vertical setup. It worked well enough. I started out on 20 meters. Since I didn’t have cell service, I’d rely on getting spotted automatically by RBNHole. This worked, but I had some station talking and tuning up over me. I kept thinking it was Jamie, since he was operating very nearby on 40 meters. But every time I looked over at him, it was obvious it wasn’t him causing the interference. I couldn’t tell what they were saying, since I was using my CW-only MTR-3B. I managed to make a few contacts on 20 meters, then waited a bit for Jamie to finish up on 40 meters before I switched to that band and made several more contacts. Successful activation complete, we packed up. Jamie signed the summit register, then we prepared for the descent. Amazingly, while we’d been on the summit, two more people had visited. And we saw another on our way down. I suppose, even though it’s pretty remote, Boundary Peak is pretty popular since it’s the state high point. We left the summit around 3:30pm. There were some nice items in this summit register box! I was a little bit apprehensive about the trip down from Boundary, since there were some pretty steep sections. It turned out to be a non-issue. We just kept a steady pace and paid attention to where we were going. It wasn’t long at all before we were back down to Trail Canyon Saddle. That feature that looks like a little hill? It isn’t. Especially after a long day of hiking. It’s a little over 500 feet of elevation from the saddle to the top of it. Not really a big deal, but again—a bit of work after hiking all day. We crossed over the saddle and hiked straight up for a while. Then, I traversed left a bit while Jamie continued straight up the peak. The sun was getting a bit low in the sky, which didn’t bother us now that we were off the most dangerous part of the route. We were rapidly entering the “golden hour” and the light cast on the landscape was absolutely stunning. This snag really caught my eye as the sun set behind it. Arriving around 6:00pm, we didn’t waste much time before getting set up once we made it to the top of Trail Canyon Peak. The sun was setting. With the wind blowing at these lofty heights, it would be getting cold quickly! I set up the EFHW antenna in an inverted-V configuration. I coordinated with Jamie that I’d just work 30 meters. And then I prayed I’d be able to make enough contacts to qualify for the SOTA points, with the setting sun, on a single band. Fingers crossed, I snapped a couple of photos before the light went away, and got to work! I started calling CQ as the sun disappeared for the day. It took a number of calls, but I started getting answers. A couple of them were really quiet, but I managed to make the necessary number of contacts. Thank goodness for the chasers out there willing to give 30 meters a try this late in the day! Thank you! I quickly packed up my stuff and headed over to check on Jamie. He wrapped up his contacts after a little bit. We started our hike back to camp in the dark. It was an easy hike down. At camp, we had dinner and celebrated our success. Sure, we would have loved to have gotten Montgomery Peak, but we got two summits and made it back in one piece! One more sunset shot of Boundary Peak!